Archives : MID-CAPS OUTPERFORM - 07/12/2012. RALLY NOW MORE BROAD BASED. Mid-caps woke up from deep slumber and started to rally; was the story of last week. Even though the Nifty netted a weekly gain of just 28 points, the real story was the way mid-caps and small-caps outperformed the broader market. The trend continues to be upwards in all timeframes, but since majority of oscillators are in overbought territory, a small retracement or a dip will be a buying opportunity for the bulls. Nifty remains well on course to reach the first target of 6148-6160. Sensex opened the week at 19342, made a high of 19561, low of 19186 and closed the week at 19424. Thus it registered a strong weekly gain of 85 points. At the same time the Nifty opened the week at 5878, made a high of 5948, low of 5838 and closed the week at 5907. Thus the Nifty went up by 28 points on a weekly basis. Both the indices have registered a Bearish Engulfing on the daily charts. But both the days are small body candles. Hence it falls short of being an effective Bearish Engulfing. On the weekly charts, both Sensex and Nifty have formed a small white body candle. This comes on the back of a big white body candle formation last week. This can be termed as a consolidation rather than a reversal. The indices have safely remained above the short term average of 20dma (Sensex – 18829 and Nifty – 5728), and medium term average of 50dma (Sensex – 18764 and Nifty – 5704). Also both the indices are well above the long term average of 200dma (Sensex – 17609 and Nifty – 5345). Thus the trend in the short term, medium term and long term timeframes continue to be bullish. MACD and ROC are both positive and continue in Buy mode. RSI @ 70 continues to remain in overbought territory for more than a week now. The same story continues with MFI which is at 90 and overbought for more than a week. Stochastic Oscillator is also in overbought zone as %K is at 93. It has given a fresh Sell as %K has gone below %D. ADX has moved higher to 30 indicating that the uptrend is now strong. The Directional Indicators continue in Buy mode as +DI remains above -DI. OBV continues in Buy and is also making higher top higher bottom formation. Oscillator analysis suggests that since majority of the oscillators are overbought, minor dips can be expected; but those dips will be a buying opportunity. The Nifty O.I. PCR is quite steady at 1.26. Highest Open interest build up for the December series is at 6000 Call and 5500 Put. This suggests that the market expects a trading range for the Nifty with support coming in at 5500 and resistance around 6000 levels. Over the last couple of days, Nifty 5800 strike has seen high Put writing and hence one can expect a strong support at Nifty 5800 in the near term. Trendline Support for the Sensex is at 18815. Trendline Resistance for the Sensex is at 19807. Trendline Support for the Nifty falls at 5740. Trendline Resistance for the Nifty falls at 6021. For the week ahead, Sensex will find Support at 19137-18866-18590 and will find Resistance at 19697-19973-20238. For the week ahead, Nifty will find Support at 5815-5733-5649 and will find Resistance at 5998-6089-6185. Once again it was a great week as all the recommendations performed exceedingly well, except for Dr. Reddy. 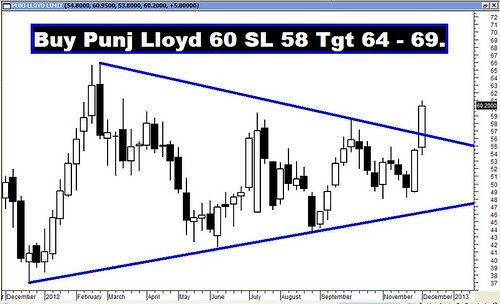 However the Star Performers of the week were Punj Lloyd and Jain Irrigation which went up by more than 13% and 12% respectively!! !